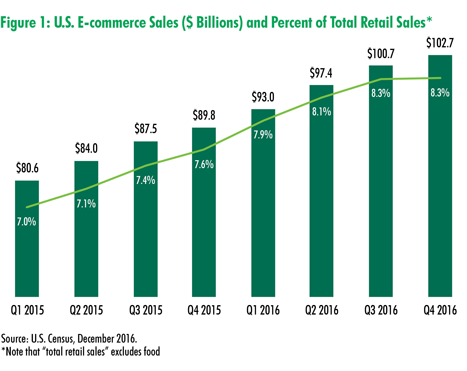 E-commerce accounted for 8.3% of all retail sales in Q4 2016, fueled by a post-election boost in consumer confidence and a flurry of last-minute holiday shopping. Retail sales in November and December increased 4.0% year-over-year, exceeding a predicted 3.6% increase by the National Retail Federation. Increased sales led to record returns, with UPS expecting to process more than 5.8 million packages in the first week of January. E-commerce remains the fastest-growing retail category, rising 14.3% from 2015 and well above the 4.1% growth rate in overall retail sales in 2016. The impact of e-commerce on industrial and retail real estate has been mixed. Industrial vacancies across the U.S. have fallen rapidly, as users look for additional facilities to build out their e-commerce supply chains. Conversely, retail vacancies have risen in many secondary and tertiary markets, as major brick-and-mortar retailers reduce space and focus on prime store locations and online fulfilment. Seasonally adjusted retail sales (excluding food) in Q4 were more than expected, rising 1.6% from Q3 and 4.1% from a year earlier—exceeding expectations for a 3.2%-to-3.8% annual increase by various market analysts. The strong consumer spending in Q4 was supported by a post-election surge in consumer confidence and continued wage and job growth. After falling in October, holiday spending increased by 4.0% between November and Christmas Eve, according to MasterCard. The surge in last-minute shopping activity was highlighted by strong demand for home furnishings and men's apparel. 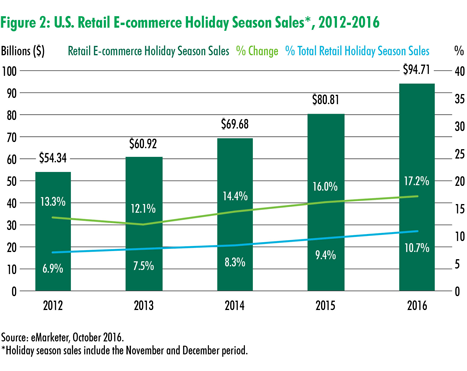 In-store sales figures this past holiday season reflect changing trends in consumer shopping preferences toward mobile and online platforms. Q4 e-commerce sales grew by 1.9% compared with Q4 2015 and by 14.3% for the year. Online sales once again far outpaced the 4.1% annual growth in traditional store sales. E-commerce receipts totaled $102.7 billion in Q4, accounting for 8.3% of all retail sales. Although the growth rate for e-commerce sales exceeded that of brick-and-mortar retail sales, traditional retailers still dominated total retail sales by a significant margin. Brick-and-mortar retailers are leveraging online and mobile platforms to drive both online and in-store sales. Retailers reported that email was the most effective method of communication for driving foot and online traffic this past holiday season, with half of web traffic and 30% of retail sales coming from mobile sites, according to Adobe. Thriving brick-and-mortar retailers have adjusted their footprints, revamped their location strategies and reconsidered staffing to gain new customers, enhance brand awareness and provide value-added services in today’s new era of retail. As e-commerce grows, retailers and logistics companies are savvier about managing customer expectations and handling the surge in package deliveries and returns expected each holiday season. UPS declared January 5 as “National Returns Day,” when holiday shoppers were expected to return 1.3 million packages. More than 5.8 million returns were expected in the first full week of January. As online retailers raced to fulfill last-minute orders as late as 9:45 p.m. on Christmas Eve in some markets, other retailers improved their order fulfillment rate by setting an earlier deadline for guaranteed deliveries by Christmas Day. A majority of retailers processed all online orders that met their deadlines for guaranteed delivery, exceeding a fulfillment rate of 95% in 2015 and 87% in 2014, according to consulting firm Kurt Salmon. Parcel delivery giant FedEx expected holiday shipments to increase by 10% this past season, while UPS expected to handle more than 700 million packages between Thanksgiving and December 31, beating last year’s all-time high by 14%.